In order to round out my budding "Nippon" army, I've purchased a few models from Perry Miniatures. Perry Miniatures are an independent company owned by the infamous "Perry Twins" - two of the creators of many, many Citadel Miniatures. For anyone interested in what they look like (the twins, not the miniatures), their photo appears in the original "Warhammer Siege" rulebook. I don't know if they're still working for Citadel/GW or not, but their own company "Perry Miniatures" is currently making historical models in both plastic and metal. The Samurai range is only available in metal. 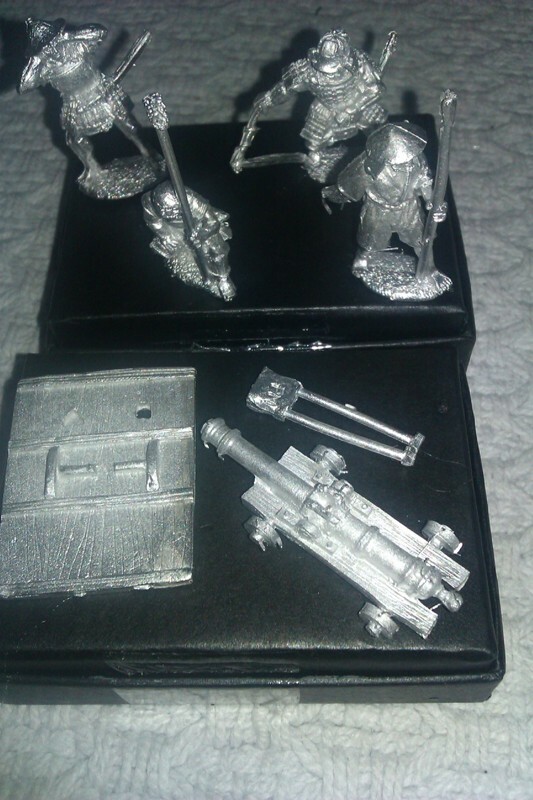 Needing among other things, some Ninja, Monks and a Daimyo, I decided to order some of their products. The ordering process itself was simple enough, communications were good and the goods arrived in a very "rattley" taped up cardboard box within a few days. 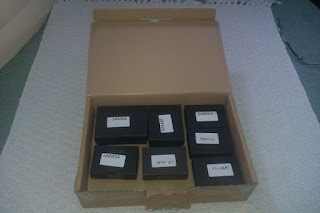 Slitting the tape and opening the box revealed: More boxes! And the reason for the rattle. I'll show each of these sets one-by-one below, but just a general point on packaging. I hate excessive packaging. It inflates postage costs, means my recycle bin fills up faster and there's obviously more waste. However, I think these guys have gone slightly too far the other way. The lead these models are made from seems to be quite soft, and there were a greater amount of bent swords and whatnot than I was happy with here. A bit more room in the boxes would have helped, I think. 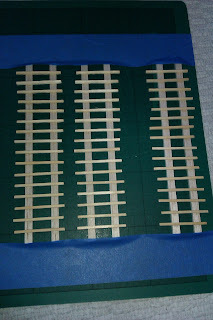 The Naginata are clearly separate and need gluing into place. Ninja - 5 standing and one lying down (crawling, I guess, or suspended from a wire, Tom-Cruise-style). The set contains 6 Mantlets - I've only shown three here. 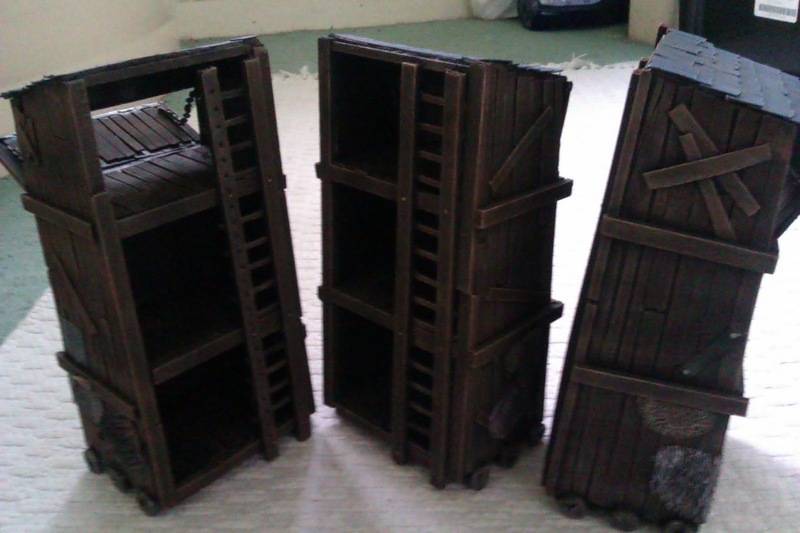 These are really intended just to add to my "Siege Equipment" roster so you'll probably see them painted up on another blog post soon. 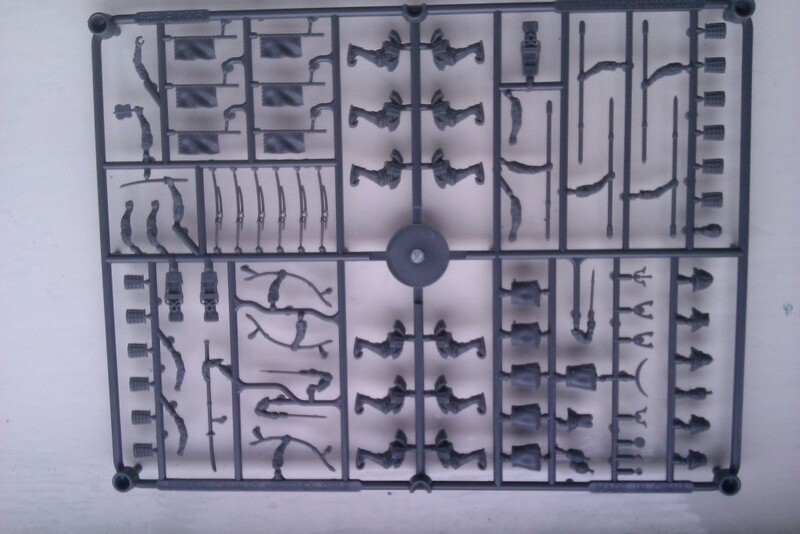 This set contains the cannon (1 piece), 4 crew and 2 large Mantlets (only 1 shown. These will also migrate to my Siege equipment posts soon). 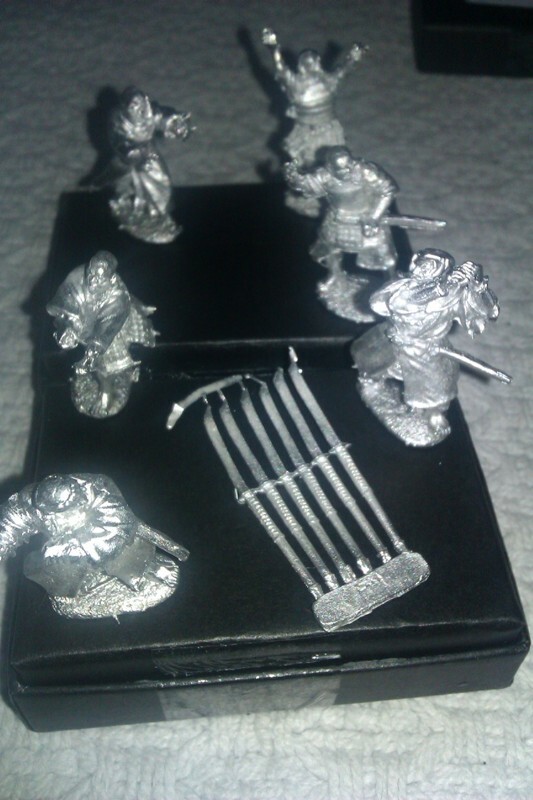 ...and comes with 2 standard bearers and a Samurai. 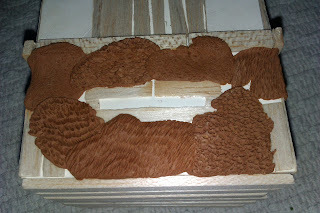 The models are on bases which are moulded as part of the models. The legs are quite slender so I'll probably just glue these on top of slottabases rather than removing them and trying to fit pins in. 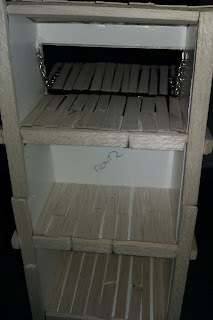 The moulded bases are thin enough to hide. Flash! It's been a long time since I've seen metal models with this amount of flash and mould-lines. It's a real shame as the models themselves really do look lovely, but they will require a deal of clean-up which may in a few places cause a loss of details. My only other niggle is with the Ninja sets. I have two sets of these both containing identical models. That means I have two Ninjas lying down. Not all that useful. 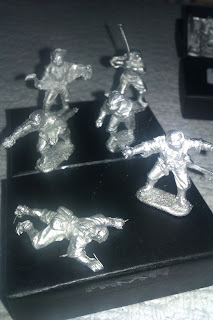 I have thought about mounting them on 40mm bases and using them as couple of "unit fillers" representing 4 models, but the Nippon rules state that the Ninja unit can skirmish so that might play a little strangely. I'll give it some thought. Minor issues aside, I'd still have to rate these models as good value for money - you end up paying (not including shipping) just over £1 per model which is extremely cheap for metal 28mm minis. It's way cheaper than GW plastics! All told, these are a good buy and I'd recommend them. Siege Equipment: Siege Towers - Finished! 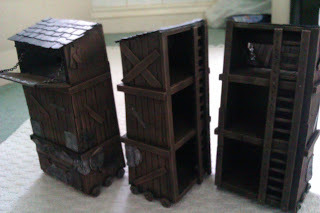 In preparation for a Warhammer Fantasy Siege game that I have coming up soon, I've been working on some projects to ready some siege-specific equipment. 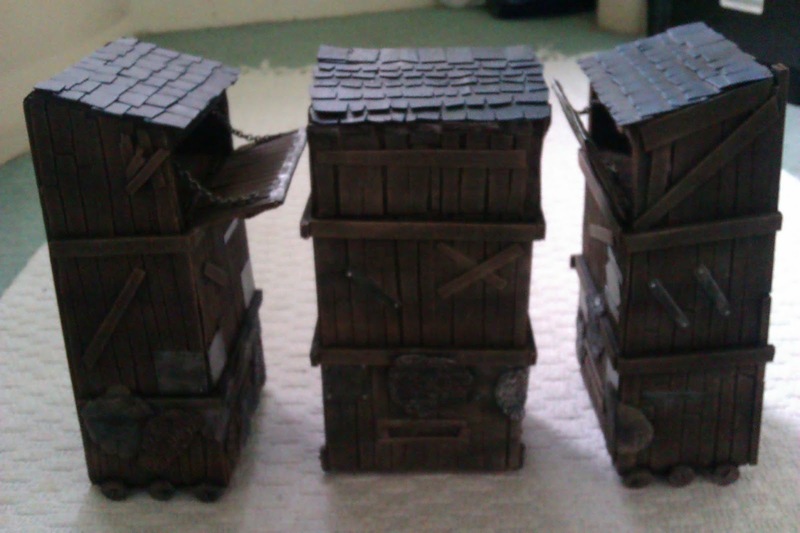 This post covers the first of them: Siege Towers. Siege Towers are a vitally important part of siege warfare. 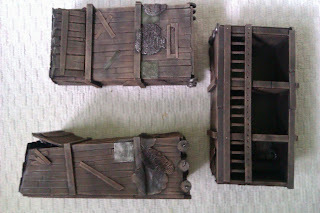 Being basically a multi-storey shed on wheels, it allows attacking troops to approach a fortress with about as much cover as you could hope for on the battlefield. Please note: all photos in this post are just mobile phone snaps and therefore not the greatest quality. When I field these models in battle in a few weeks I'll endeavour to take some better pics. I started building mine by creating a framework from foamcore. 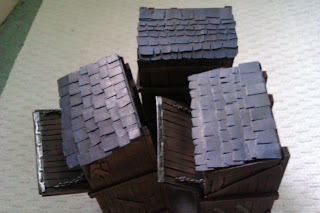 I'd measured up the height of my castle walls (I have the old styrene Citadel "Mighty Fortress" set from circa 1990 - I'll cover painting and battle-damaging that in a later post) and attempted to create tower pieces that were going to be approximately the right size. There were some guesswork and unknowns going in as I was missing a key component: Wheels! Without knowing the size of my wheels (more on them later too) I couldn't be 100% sure of the height my towers needed to be. At the end of the day, though, it doesn't really matter if the scale is a bit off - these models are only representative of troops/fortifications/equipment at the end of the day. I'd decided to build three towers - more than I need for the upcoming game, but who knows what games I'll play in future. Be prepared! The roof is just a rectangle of thick card; the walls and base and the levels that will be inside will give the model all the strength and rigidity it needs (I hope). No siege tower that ever took the field for real was ever built from foamcore - wood is the material of choice so I clad my towers in balsa. I used a very, very thin sheet for the majority of the planking, very roughly cut. I also used a slightly heavier-grade "rod" to form "beams". The roof tiles are just rough rectangles of card (a cereal box) overlaying each other. Now, any good siege tower needs a way that the troops within can exit onto the ramparts of the castle and storm the walls. This is where things get tricky - opening doors need hinges of some sort. After a few minutes musing (I don't like to think too hard about anything) I came up with the idea of just using gaffer tape (duct tape or carpet tape are pretty much the same thing). It's strong, flexible and very sticky so wouldn't come loose. I added a couple of staples into the section that covers the foamcore front wall just for a bit of extra strength, but they really don't add much. The door itself is just a bit of thick card. The chains were sourced from a local budget fashion shop - they're harvested from some very inexpensive costume jewellery. The attachment points for the chains are just made from paperclips which were cut down, bent to shape, inserted through the door/side wall and gaffer-taped into place. 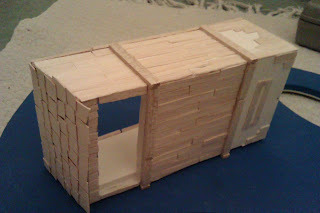 The door itself is then covered with more balsa planking. 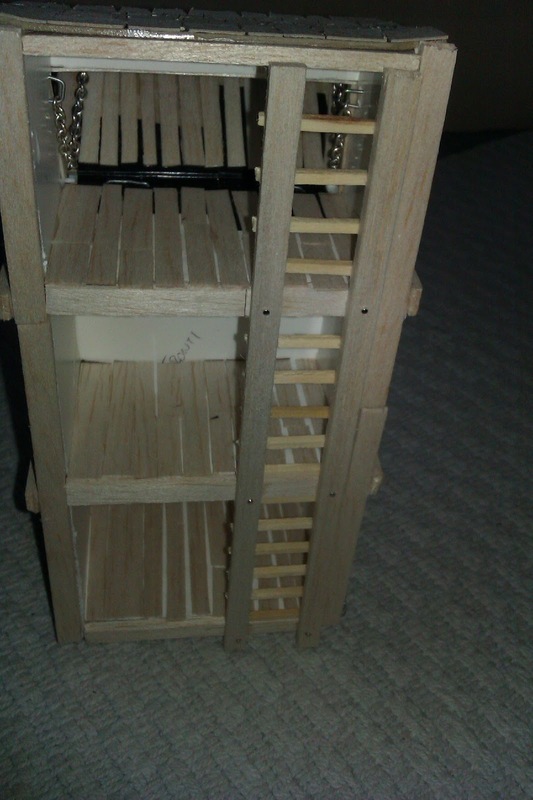 Some platforms were added inside the towers and cladded with yet more balsa. 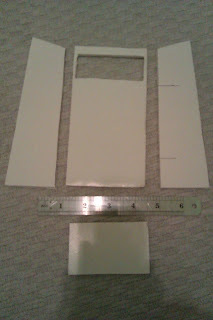 I then used some of the heavier-grade balsa I mentioned to cover the edges of the foamcore. The next thing I needed were wheels. Bearing in mind that after these towers are complete I'm also going to be building some battering rams which will need four wheels each and that these towers will need six wheels each and I'm building three towers and two or three rams, that's a lot of wheels (26 or 30 depending on how many rams I build). There was no way I was going to get that many wheels from "bits" suppliers, certainly not at a reasonable cost. Then I remembered a purchase from many years ago when holidaying in Cork, Ireland. I visited "Prince August" - a manufacturer of miniatures and moulds for miniatures. 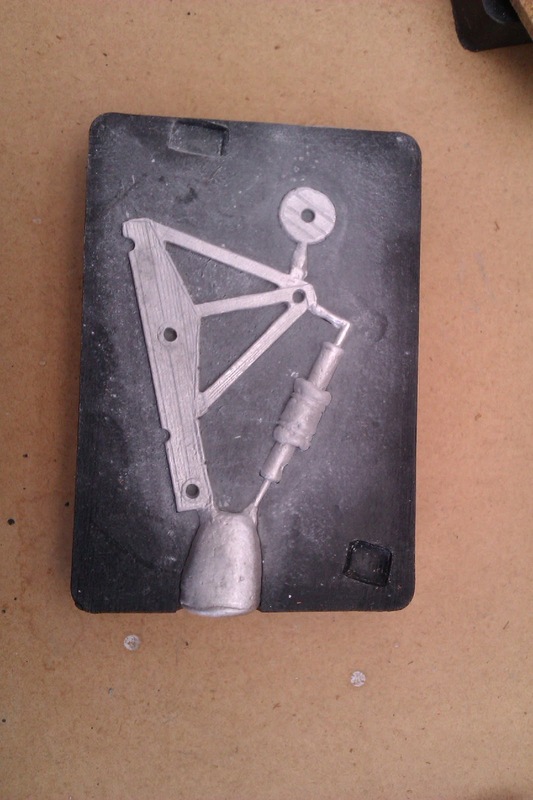 Among other things I bought was a mould set for a stone-thrower. They've got wheels! A few minutes hunting in the loft and I found my kit: moulds, some white metal, a melting pan and some grippers for holding the moulds. Brilliant! I still had a problem though. The melting pan is minuscule - way too small to use on a gas job like in my kitchen. Solution: a single electric job from Amazon for about £15 including shipping. Still cheaper than buying wheels AND I could use it to make other models on too. Kit assembled and work begins. 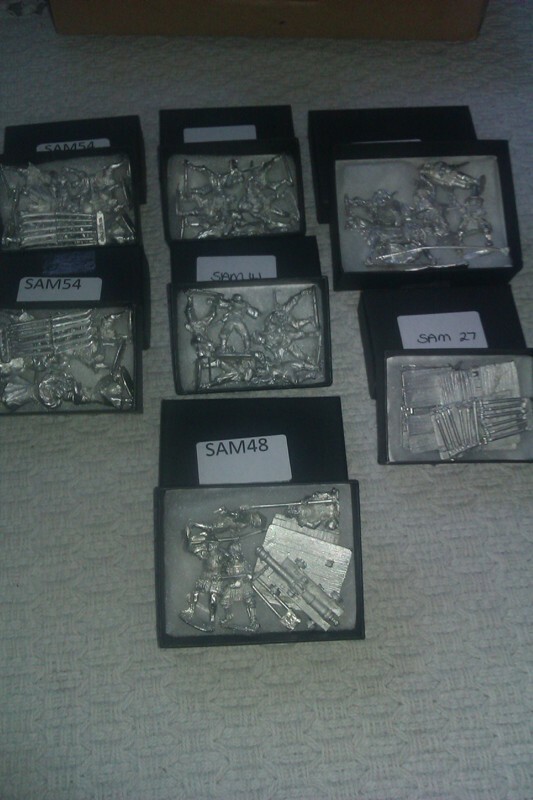 An hour later and I have plenty of wheels, parts for stone-throwers for my Dwarfs and one burnt finger. 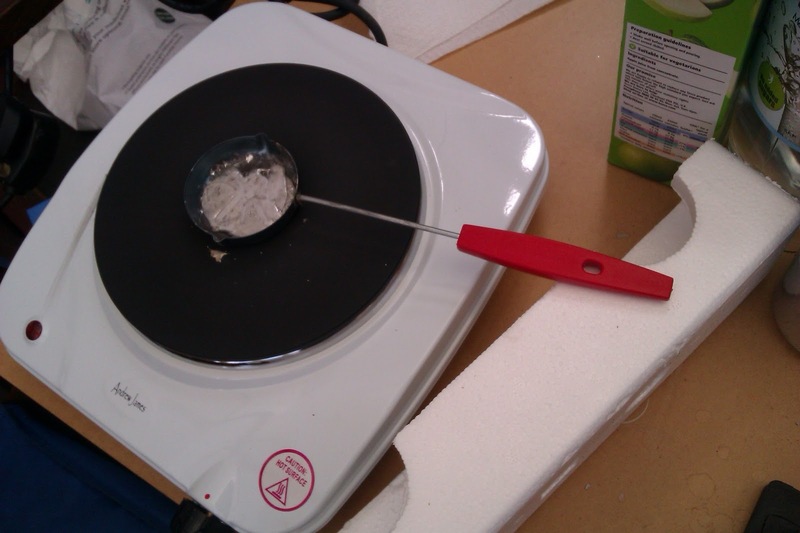 All the excess bits of stone-thrower just get re-melted to make enough metal for the next casting. Before attaching the wheels I decided to add some detail. 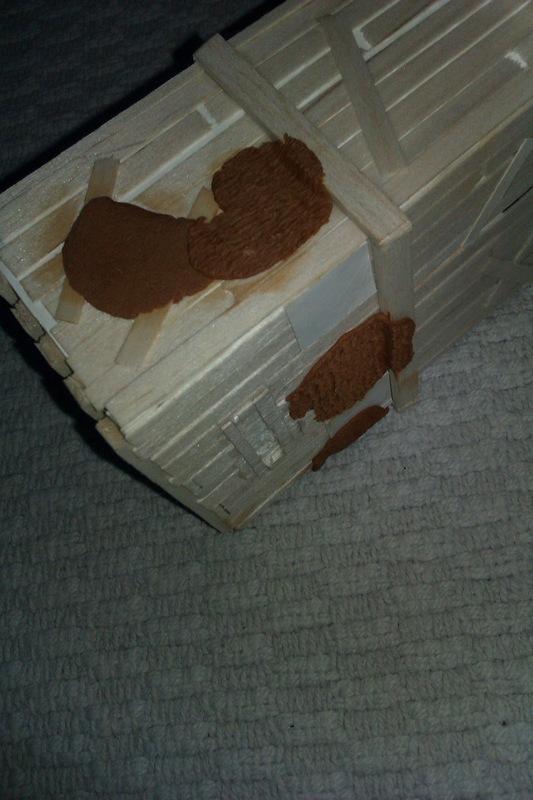 I'd added small features like extra bracing-planks at angles across the upper parts of the towers in random positions, covering imaginary damage-holes and so on. 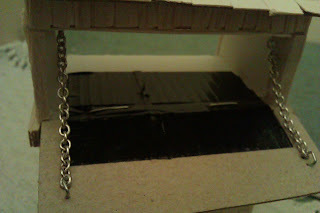 I'd also cut a few short sections of card to add some "metal plates" and strips here and there. 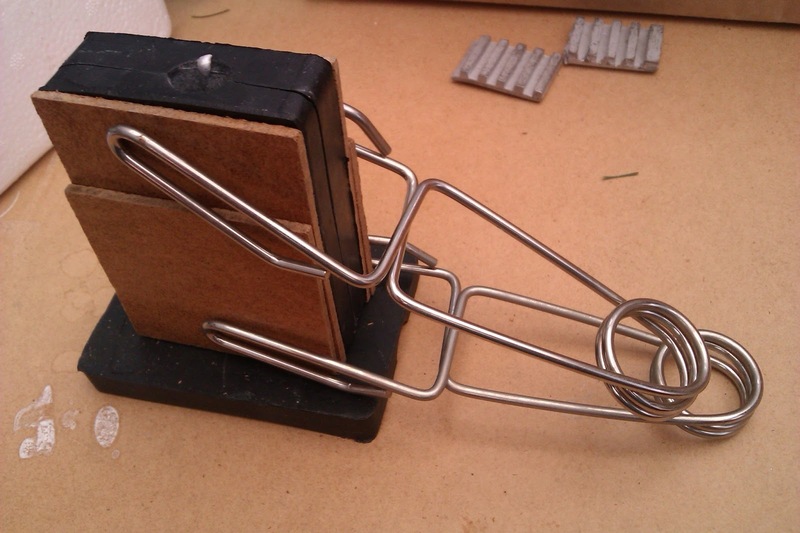 Another card strip went across the leading edge of the front hatches to represent a metal edge-piece. It occurred to me that the balsa would glue well to the card on the foamcore and give the Milliput something to "key" to. Anyway, I added rough shapes of varying sizes and textured them as best I could to make a variety of different finishes, using a Citadel sculpting tool, a knife-blade, an old toothbrush and some dentist picks (dirt cheap off ebay and very useful). Next I was going to need ladders. This was undoubtedly the least fun part of the build. I originally tried to build these like "real" ladders with the "rungs" (matchsticks) inserted into holes drilled into the balsa (heavier-grade) side-pieces. Far too fiddly. Gave up. 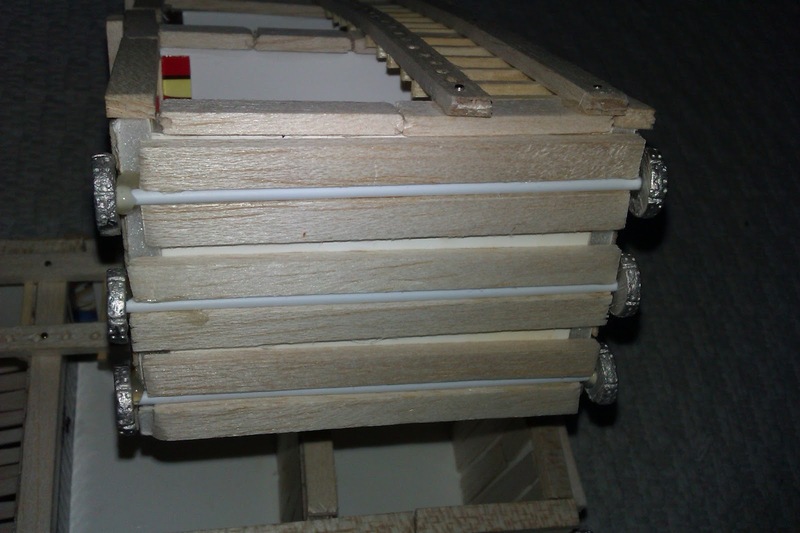 I eventually just taped the balsa down and glued matchsticks at regular intervals. When dry I snipped off the excess with sprue-cutters. 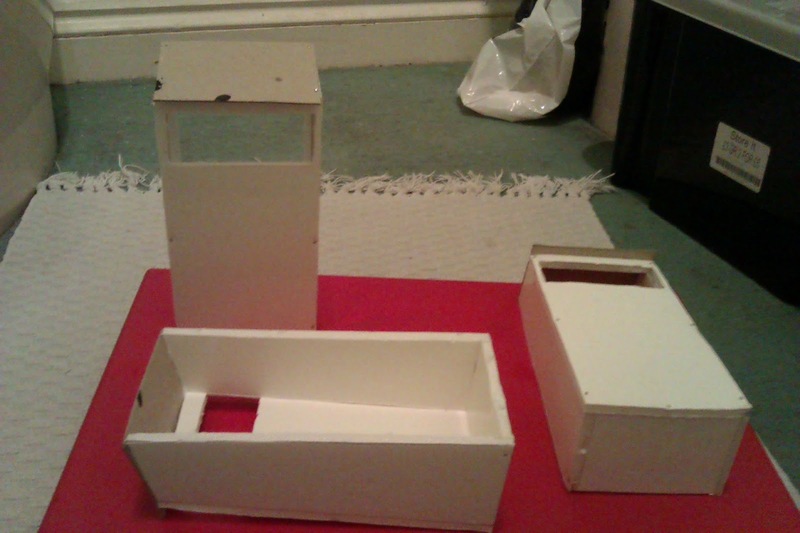 Then it was assembly-time - attaching the ladders and wheels to finish the build. This was the easy bit - I PVA-glued some balsa (heavier grade) to the base in order to create "channels" that I could insert the wheel axles into. 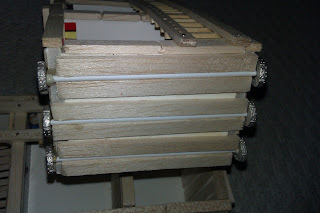 When dry, I hot-glued the axles (some plastic rods from my local modelling shop) into the channels and glued the wheels on. 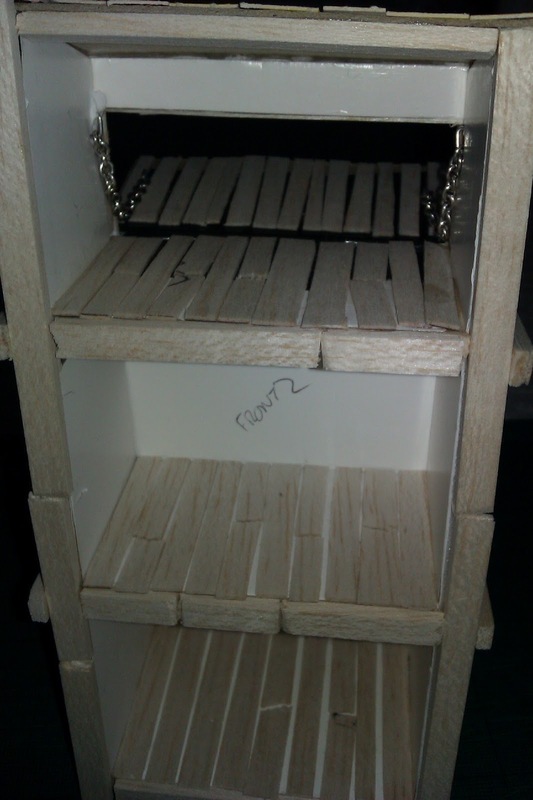 The ladders were PVA'd and pinned into place and "build done". So far, I'd considered the build of this lot to be quite laborious. 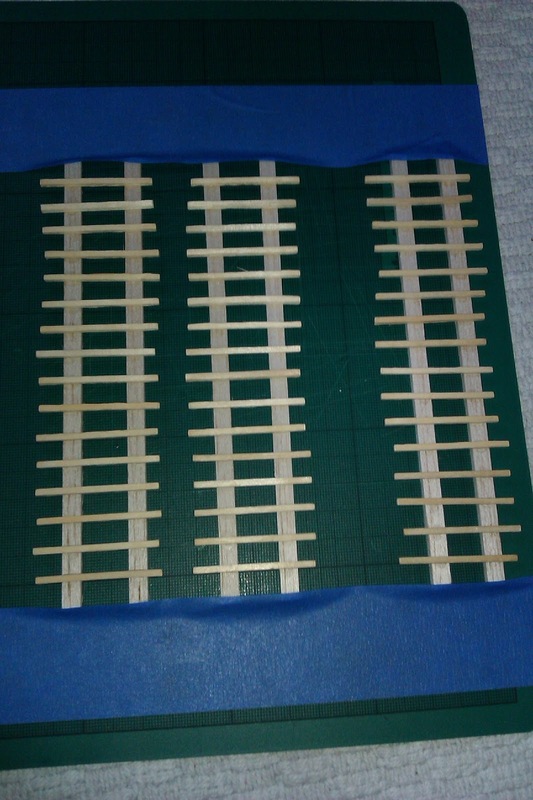 All that balsa cutting, trimming and glueing had taken quite a while. I now consider that to have been the fun bit, when compared to the tedious drudgery of basecoating them! For convenience(!) sake (i.e. being too lazy to get my airbrush out) I'd elected to brush-coat them. I couldn't use a rattlecan primer as it would have dissolved the foam in the foamcore. Brush painting the base black on took an age and was difficult to get into all the nooks & crannies too. Also a mistake was attaching the ladders before I painted. 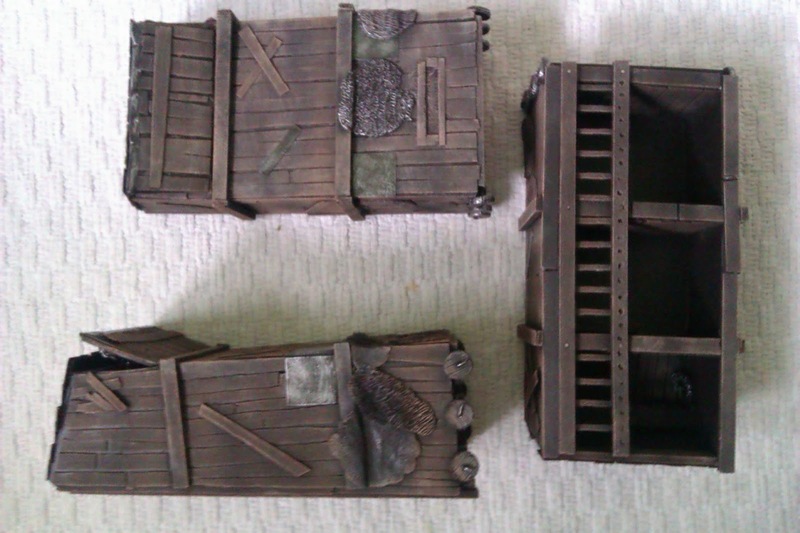 Anyway, I've got the wood drybrushed to my liking and have also done all the "metal" bits (though I think I'll paint some rivets on to make them a bit more interesting). 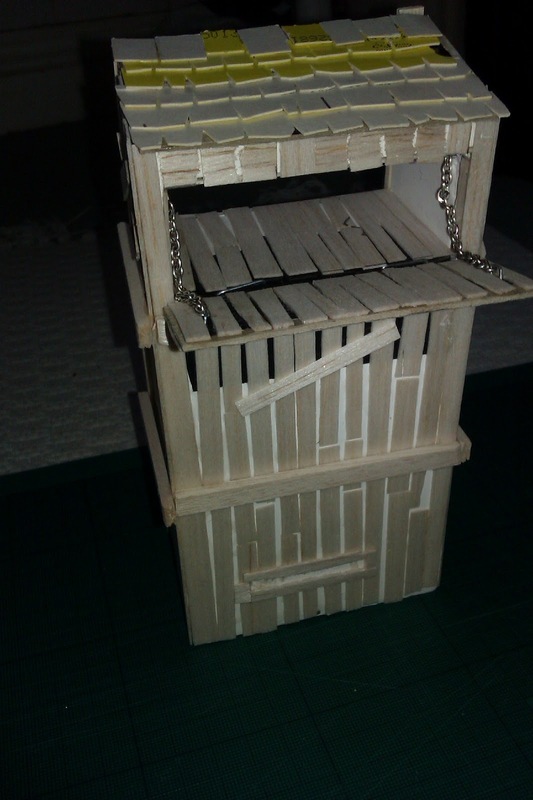 All that's left is the animal skins and the roof. And I'm done! A few layers of progressively lighter blues applied to the roof tiles to make them look like "slate" and some drybrushing on the modelling-clay animal skins and mail cladding and a bit of varnish and I hereby declare this project "closed". Now I need a castle! I feel another project coming on. 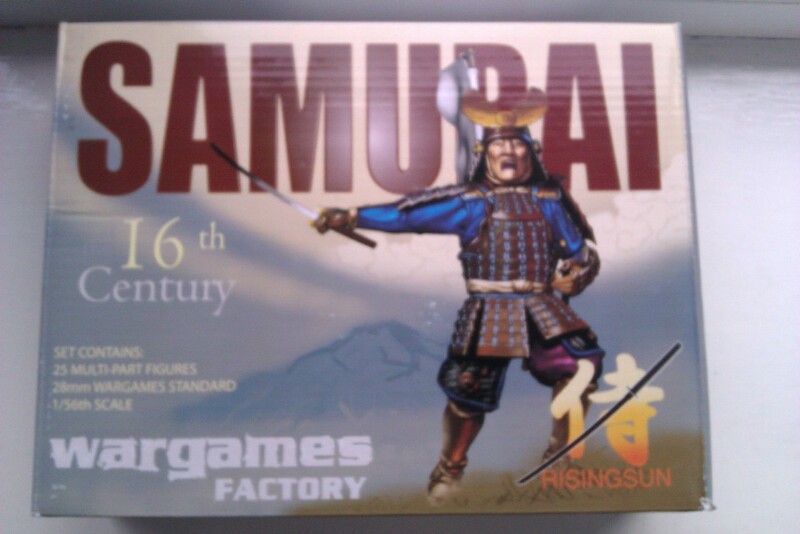 Here is the fourth and final installment in the "Unboxing" series on the Wargames Factory "Rising Sun" range. This time it's the "Samurai Cavalry" box. 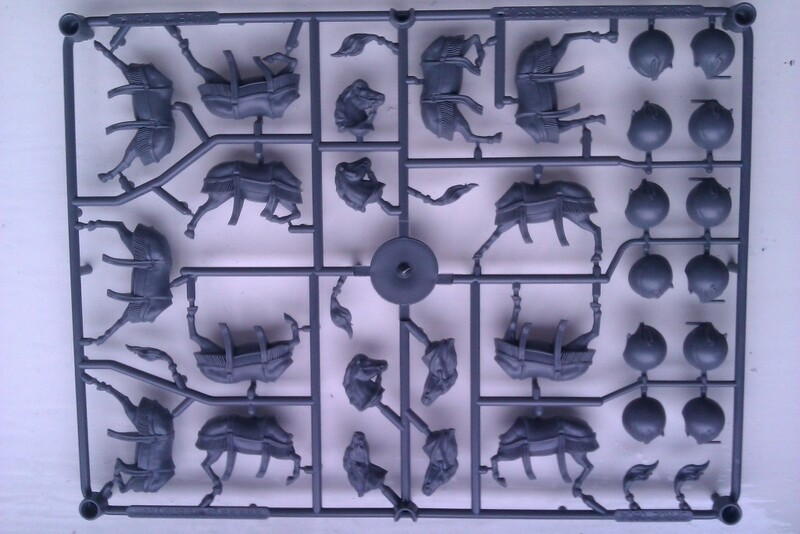 Unlike other boxes in this series, this set contains not 25 models, but 12 (fair enough as they have to be supplied with horses). The models are based on 25mm x 50mm bases so fit nicely into Warhammer games. 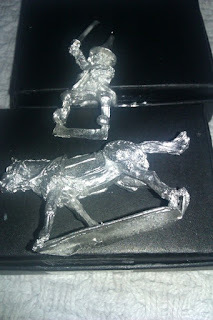 Riders and horses are supplied on separate sprues (which all still stack nicely - sorry if you were expecting to get away with me mentioning that this time) with six riders or six horses on a sprue. 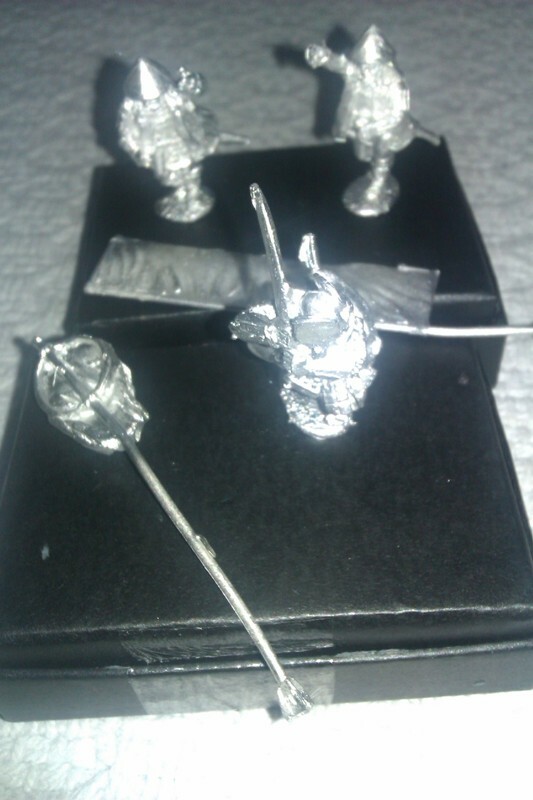 So four sprues for the models and a further sprue for the bases. There's a bit more available to the Mounted Samurai in terms of weaponry than in the infantry set as they can be equipped with Katanas, Yari or bows (bows did not feature in the infantry set). The parts seem to be easily interchangeable, so I don't see why you couldn't add bows from this set to models from the infantry set if you wanted. 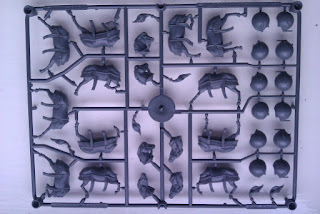 The horse sprues are unremarkable - they contain the bits to make some horses. 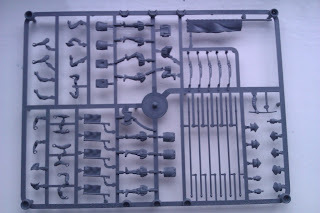 Not much to say, other than to point out the large, spherical items on the right of the sprue as pictured below. Apparently, these represent large leather bags that the Samurai would mount behind them and inflate with air. These provided an ingenious, lightweight armour from missiles being shot from behind them. After being pierced once or twice they might deflate, but otherwise formed an arrow-proof shield that weighed very little. If playing the "Nippon" rules, I guess these could be used to represent "Horo Cloaks". Once again, the models are of a very high quality though are a little smaller then you'd expect in a Warhammer game. They're certainly great value at £16.00 for 12 models. All in all I'd have to give this series of models a big "thumbs up" - my only issue is that you can really only field your rank and file from these sets. There's nothing you can use for your HQ, Specials or Rare troops. In the near future, I'll hopefully be picking up some models from other sources which I'll use to grow my fledgling Nippon force and will report in on them. The third installment of my "unboxing" series on Wargames Factory's "Rising Sun" range of 28mm 16th Century Japanese miniatures. 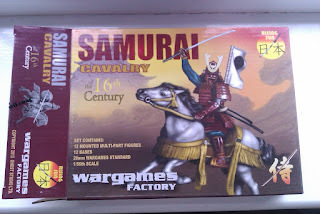 This time I'm looking at the "Samurai" boxed set. 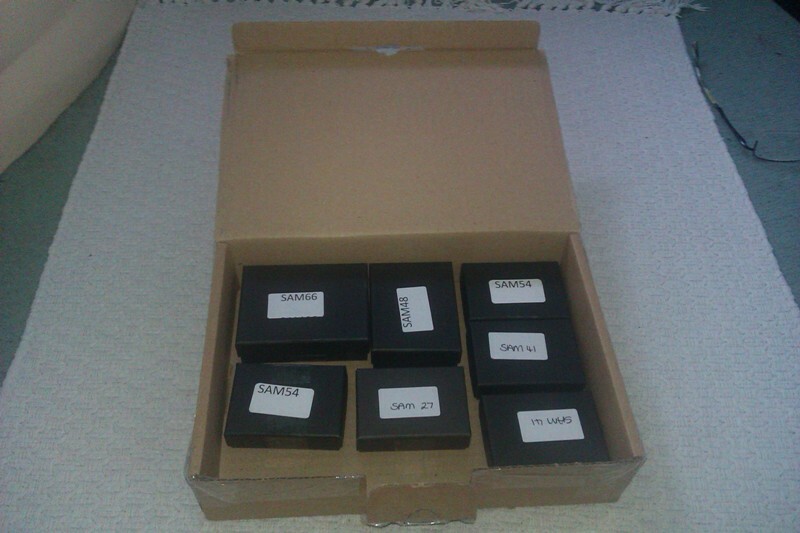 Once again, we have in our hands a box containing 25 detailed miniatures on 5 neatly stacking sprues. On the sprues themselves, we have a lot to choose from: there are 10 heads, for a start. The troops can be built in a number of different ways - either armed with Yari (spears), Katanas (swords) or Katana and Wakizashi (smaller swords as a second hand weapon). 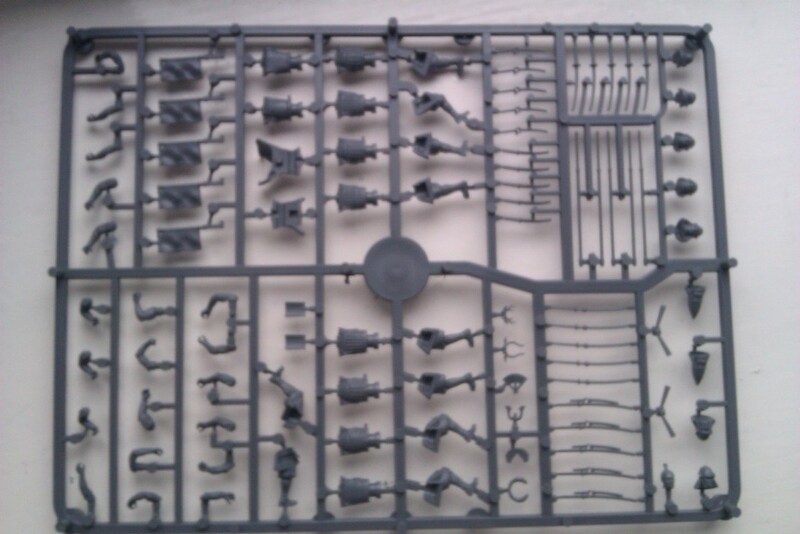 In addition, there are six body types on each sprue (though only five pairs of legs), one of which has a flowing cloak and could be used to denote a commander model. There are a number of optional helmet-crests which can be added for decoration or left off, as well as the usual Sashimono (personal banners) which can be added or not. I've not built any of these models yet, but it's clear that some great degree of thought has gone into the build process. Each arm ends with a sort of "Nail-head" shaped pin which gets enclosed by the body - this means it's going to be virtually impossible to have an arm that ever falls off (unless actually broken). It should also assist in posing the model when the glue is still wet meaning you don't need three hands with seven fingers each to hold everything together. A note about scale: all of these Wargames Factory models will stand smaller than a Citadel model which purports to be the same scale, 28mm. Now that doesn't bother me (as far as I'm concerned base size is key, height is less important) but you may want to bear it in mind. Again, at 25 models for around £16.00, these look like great value for money to me. 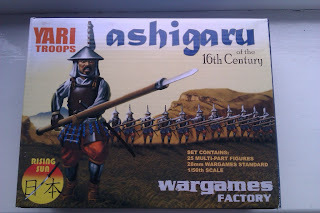 This is the second in my series of "Unboxing" articles of the "Rising Sun" range of Japanese Samurai-period troops from Wargames Factory. As in the previous article about the Ashigaru Missile troops the sprues in this set are designed to stack - I'm probably going to mention that in every post in this series: I love that feature! 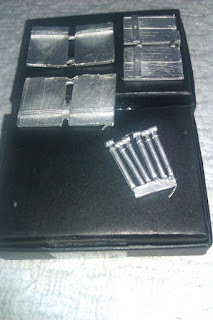 The sprues themselves in this set are a bit more sparse - not as many "bits and bobs" to play with. 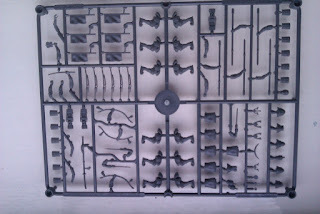 You get enough items on each sprue to build 5 Yari troops (though oddly you get 6 Yari). Each can have a Katana (sword) and Sashimono (small, personal standard). 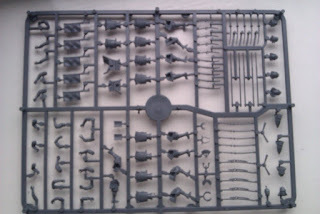 There is a variety of heads to choose from and also a standard on each sprue (which is very useful as the missile troops didn't have that feature so I'm no longer short of standards for my archers and riflemen). Bases as before are simple 20mm x 20mm tiles. So this set isn't as much "fun" as the Missile troops set, but it still does the job. 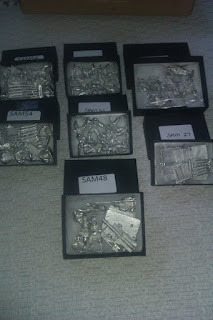 The sculpts are clean, the quality is high and once again you get 25 models for about £16.00 so the value is great.